Every so often we feature weddings that we just wish we had been invited to...Kel and Dimi's wedding is definitely one of those! 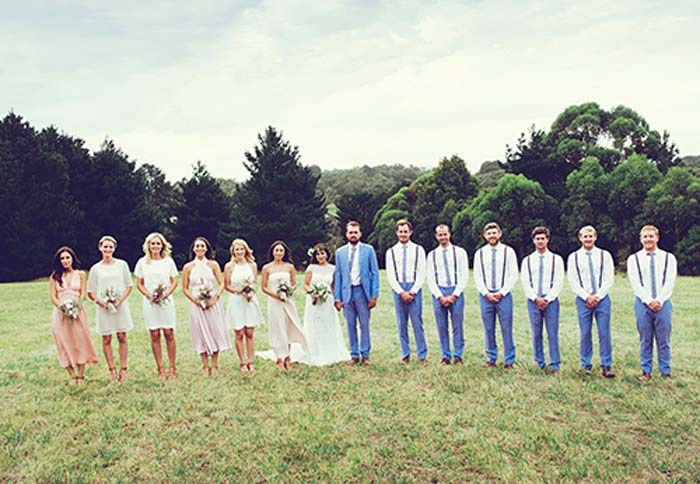 The couple along with their guests enjoyed a fun-filled day in the most beautiful setting, partaking in Greek wedding customs and savouring the goodness of home cooking. Special thanks to Eliza Harrison Photography for sharing these luminous photos with us and the happy memories of a big fat Greek wedding! We met in 2003 at a party when we were in high school. I was 17 and Kel was 16 years old. We had heard about each other through mutual friends. We knew each other for about 1.5 years before we made it official. There wasn’t a moment for either of us, I suppose it was when we decided to make it official…but I knew I couldn’t live without him early on. November 1st 2014. We were walking along Queens bridge in the city (Melbourne) and Kel stopped near the edge. I was confused, as he grabbed me and held onto me (it was very windy). He looked weird and I thought "he's either going to throw me over the edge, or ask me to marry him". I'm glad it went the way it did in the end. We both got very nervous, it was funny. The ring was gorgeous and perfect. It happened after almost 10 years together, but I was still in shock - we had to get the waiter to order for us after because we couldn't think. Vintage, miss-matched garden theme - I always love buying vintage furniture and I made the most of the wedding as a good excuse to go crazy on ebay. I wanted it to be relaxed and pretty, not fancy and perfect, but nice to look at. It had mismatched velvet furniture, and light tan table covers. Flowers were pinks and white, with some olive leaves from the property mixed in. For the ceremony there was a homemade wooden arch and homemade bench seats. It was simple lace, very fitting for a garden wedding on the property. Kel said it was very "me". I found my dress in the first shop I went into - Anna Campbell. I tried on a few more, but went back to it, I had that "this is the one" moment. The flowers were light pinks and whites, with some roses and foliage. I had a flower crown as well. Simple small vases with flowers, on each table. We had white lace on some high tables and light tan table covers on the long tables. The marquee had festoon lights across the top. We made a bunch of other stuff like the arch and the signs. We had a lot of DIY preparation at the house and property to get it ready for the big day. Fushia O'Hara, a close old friend, prepared beautiful flowers - it was perfect. Alice Parker, who is also a dear old friend (we all went to high school together), did the cake, it was amazing and delicious. Decorative elements (bunting, straws, plates, balloons, garlands etc) along with wedding favours (elements such as tags, jars, labels etc) were from Astoria Paper Products and Chef's Hat. Prop and furniture hire (chairs, drink dispensers, tables, games etc) from My Sweet Event Hire. Dessert that they could take home in bags. Dimi - The dancing (both Greek and party style). Kel - I liked the speeches the best. Dimi's dad did his first ever speech in his life (70 years old), and we got a lot of comments that it was the best speech people had ever heard. We got to bed late in the morning and were glad we stuck around until the end. Not sure. Travel. The usual - maybe a house and kids one day.